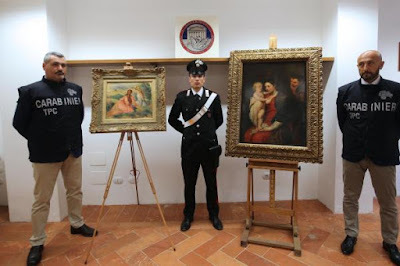 In June 2018 five individuals, were charged by the Carabinieri of the Cultural Heritage Protection Unit in Monza, Italy in connection with the theft of two paintings, "The Holy Family" (Italian: "La sacra famiglia") by Flemish artist Peter Paul Rubens and "Girls on the Lawn" (Italian: "Le fanciulle sul prato") by the French Impressionist painter Pierre-Auguste Renoir. 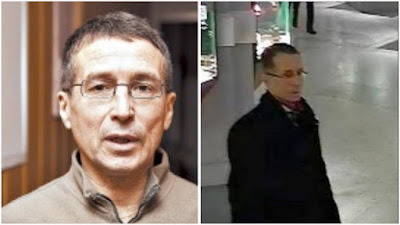 During the heist, which took place on April 20, 2017, one of the accomplices posed as a potential buyer, and staged an elaborate hoax, in which Nenad Jovanovic, presented himself as an Israeli rabbinical diplomat, calling himself Samuel Abraham Lewy Graham. Over the course of several appointments, the man convinced the two gallery representatives that he was a legitimate buyer, willing to purchase both works of art for a negotiated price of 26 million euros (about $30 million). Once the bait was set and the accomplices set about renting meeting space at Via Quintino Sella in Monza below the offices of the Albanian honorary consul to legitimise their ruse that the transaction for the paintings' sale was all set to be finalised. Instead, Jovanovic, along with another accomplice, absconded with the boxes which contained the paintings using a nearby Peugeot automobile to make their getaway. 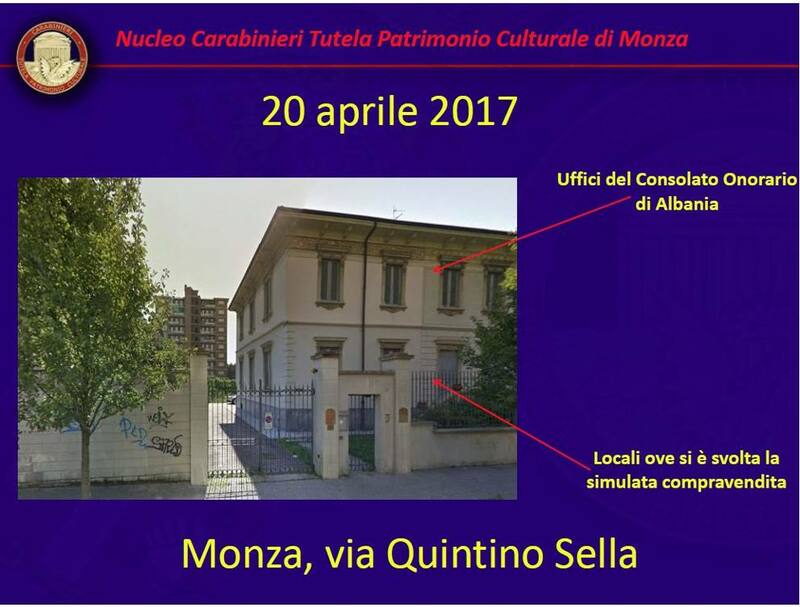 Seventeen months later, a total of eight individuals have been implicated in the crime and law enforcement authorities announced yesterday that both works of art have been recovered this week from inside a warehouse in the province of Turin. Major Francesco Provenza of the Carabinieri has stated that the recovered canvases will now undergo scientific evaluation by experts who have been appointed by the Monza prosecutors in order to verify their authenticity and attribution. On the evening of February 17, 1975, twenty-eight Impressionist and Post-Impressionist works of art were stolen from the Galleria d'Arte Moderna in Milan. In total works of art by Vincent Van Gogh, Paul Gauguin, Paul Cezanne, Auguste Renoir, Amedeo Modigliani, Jean-Baptiste-Camille Corot, the 16th century Flemish master Adrien Van Utrecht, Francoise Millet, Giovanni Fatter, Telemaco Signorini, and Giovanni Segatini were stolen. 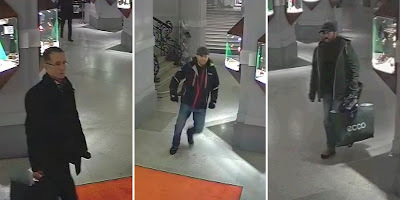 The theft occurred despite the presence of watchmen on the premises, who were assigned to regularly patrol the museum and in theory who were required to make ten rounds of the exhibition spaces during each shift. To accomplish their crime criminals broke into the museum through an unalarmed first floor window. They then mounted three flights of stairs and once in the upper Grassi Gallery proceeded to cut the artworks free of their frames, leaving them in a horrifying discarded heap. stolen from the Galleria d’Arte Moderna. While no details of any arrests were announced in connection to the theft it is understood that the thieves may have demanded a hefty ransom and that this demand was most likely met. The works of art were conveniently recovered together on April 6, 1975, in an unoccupied sixth‐floor Milan apartment which had been registered to an alias. That apartment was later traced to Giuseppe Pennestri, an individual from Reggio Calabria living in Milan. At the time the artworks were recovered, and given their good condition the artworks were valued by newspapers at USD $5 million. While the Galleria d'Arte Moderna got its collection returned, by giving in and paying a thief's ransom, they encouraged further robberies. 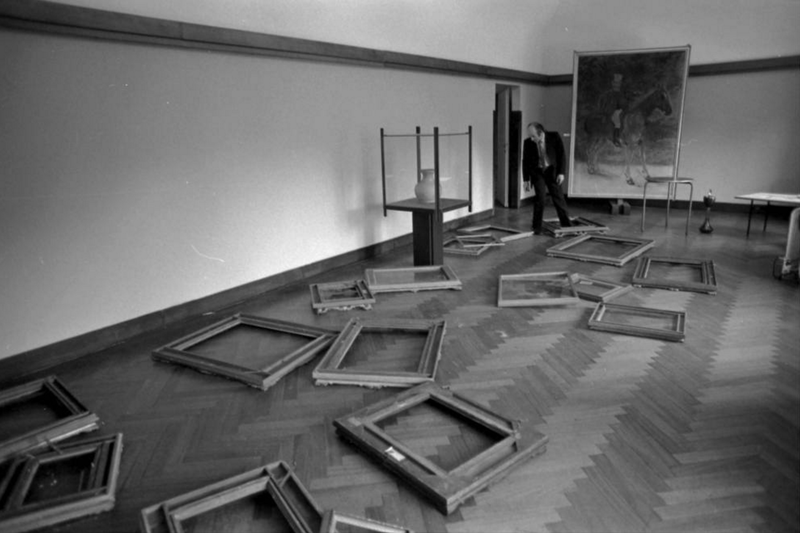 Just three months later, on May 15, 1975, thieves struck the museum for a second time. As if to add insult to injury, the second theft made use of the same security vulnerabilities. Thieves entered the museum via the exact same avenue taken earlier, as if the first theft was a dress rehearsal for the second grand performance. To break into the museum they came in over the high wall around the museum and then penetrated the building by climbing a ladder and entering through an upper floor window which had not been fitted with a burglar alarm. Once inside they reportedly overpowered four night watchmen. Two were bound and gagged while making rounds and two were subsequently subdued in the Grassi Gallery where the criminals again made off with a substantial cache of paintings. This time, even more Impressionist and Postimpressionist works of art were stolen, 38 in total. 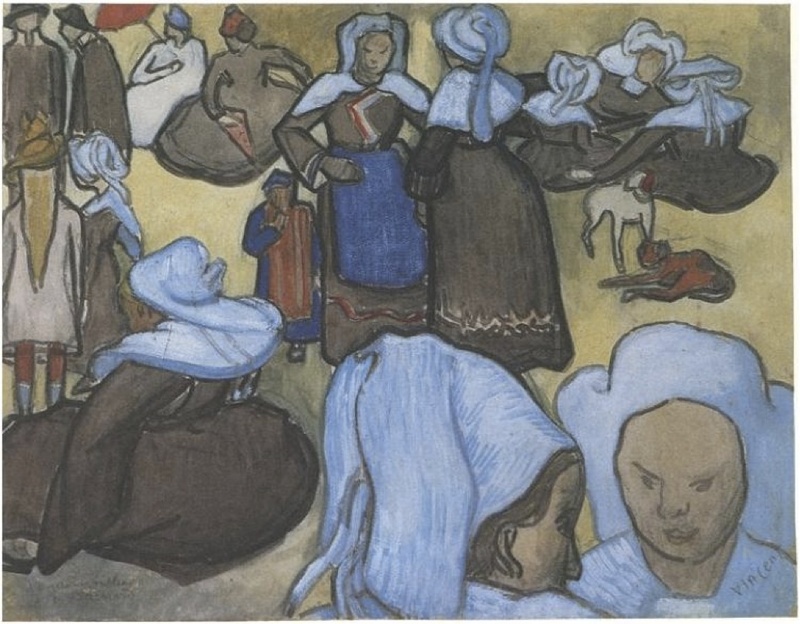 Many of the artworks stolen, including Van Gogh's watercolour Breton Women (after Emile Bernard), were the same ones taken during the previous robbery. Perhaps because the thieves were banking on a ransom having already been paid? One month later, on June 17, 1975, police got a break. During an routine traffic stop, Giuseppe Pennestri was arrested by Italian authorities while driving a Mercedes with New Zealand license plates under an assumed name. With him was a Yugoslavian also travelling with false identity papers. Pennestri would turn out to be a truly unsavoury character, with a record that included not only masterminding the theft of the museum, possibly on both occasions, but also a rap sheet that included homicide, drug dealing, facilitating prostitution and apparent ties to organized crime. Following a joint investigation involving Interpol and the Italian and West German authorities 26 of the 38 artworks stolen were recovered on November 2, 1975. Italian law enforcement officials arrested one suspect in Foligno while their counterparts in Germany arrested three individuals in Duisburg, what was then West Germany. Fifteen of the paintings were found in Italy during a raid on an apartment owned by a wealthy businessman, Settimio Bianchi. 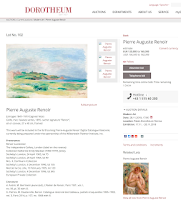 Eleven other artworks, including the works by Van Gogh and Renoir, were recovered in West Germany along with nine other stolen artworks from the Galleria d'Arte Moderna. 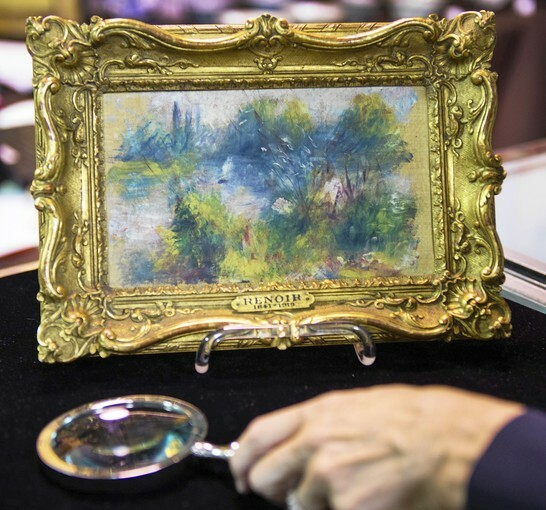 Today's scheduled auction sale of a newly discovered Renoir landscape was cancelled this week when a Washington Post reporter discovered that the painting had been stolen in 1951 from the Baltimore Art Museum (BMA). The landscape is intentionally blurred and indistinct. Fast-moving swirls of green, purple and pink and a splash of white mimic the motion of the water and the wind. The viewer glimpses the river through a scrim of shrubbery, while something gray and vertical looms on the far bank. The Virginia-based buyer reportedly preferred the frame to the painting, had let it "rattle around the trunk" of her car and stored it in a "shed with a busted window." The flea market buyer even confessed that she had torn "off the brown paper on the back and threw it in the trash". Her mother found a "tag on the painting that said 'Renoir, 1841-1919' so the purchaser took the painting to Potomack Company, an auction house she had heard of through the PBS television program "Antiques Roadshow", the new owner told McCauley. The auction house determined the painting had been purchased by Herbert L. May and Saidie Adler May from Gallerie Bernheim-Jeune in Paris in 1926. Saidie Adler May had donated more than 1,000 paintings to the Baltimore Art Museum. When McCauley wrote this article, the history of the painting was a "mystery". Then reporter Ian Shapira of The Washington Post got curious, as he tells Melissa Banks here on NPR, and set out to find out what had happened to the painting since it left Paris almost nine decades ago. First, Shapira tells Banks, the May family knew nothing about this painting so he went to the Baltimore Art Museum's library and discovered that the painting "Paysage Bords de Seine" had been loaned to the museum by Saidie May. The museum officials then matched the loan number to their records and discovered a report that the painting had been stolen in 1951. Shapira speculates that although the May family would like the painting to be returned to the museum, the insurance company that paid out [$2,500] for the stolen artwork may have title to it. "Paysage Bord du Seine" (On The Shore of the Seine), an oil on linen napkin, measuring 5 1/2" by 9" with no artist signature had been purchased for $1,000 in Paris and valued at $2,500 in 1951 when it was exhibited at the BMA in the show "From Ingres to Gaugin". Mrs. May told the museum that 'Renoir painted this landscape for his mistress, at a restaurant on the Seine - thus the linen napkin.' The museum index card noted that this Renoir landscape was stolen from the Gallery on November 17, 1951 and had been replaced by a Degas "Self Portrait". In a box full of Saidie May's letters and artwork receipts lay one major clue: records showing that she had lent the painting to the museum in 1937. The discovery startled museum officials, who had already said the flea-market Renoir never entered their institution. According to Shapira, the FBI and the museum, who are now investigating details of the theft, could not explain why this artwork does not appear on any registry of stolen or lost art. Here's a link to the follow up story by McCauley for The Baltimore Sun reporting the painting was stolen and her interviews with the BMA director, the FBI investigator, and the auction house that reports that "Renoir Girl" agrees that the stolen painting should be withdrawn from the auction sale but admits that the money would have been welcome after two years of unemployment. McCauley reports on the details of the short police report on the stolen painting here: no evidence of a break in, nothing else was stolen, and it was taken sometime between 6 p.m. and 1 p.m. The homeowner was watching television when she heard a loud noise downstairs. When she went to investigate, she was confronted by an armed man in a ski mask. ...The painting was taken with its frame intact from the stairwell where it hung. The masked robber, who forced entry through the back door of the home, is described as a white male, 18 to 26 years old, who weighs about 160 pounds and is approximately 5’-10” tall. He was armed with a large-caliber, semi-automatic handgun. According to Anita Hassan reporting for The Houston Chronicle, the thief entered the home and demanded money and diamonds but the owner, protective of her sleeping son upstairs, offered her painting by Renoir as the most valuable monetary asset available. The original reward was announced at $25,000, according to information released by The Art Loss Register who reported that the Houston Police Department and the FBI were working on the investigation. The FBI estimates that the stolen painting is worth $1 million. The private insurer is not identified. The painting's image has also been included in databases for The Art Loss Register (accessible for a fee) and Interpol (free access to registered users). 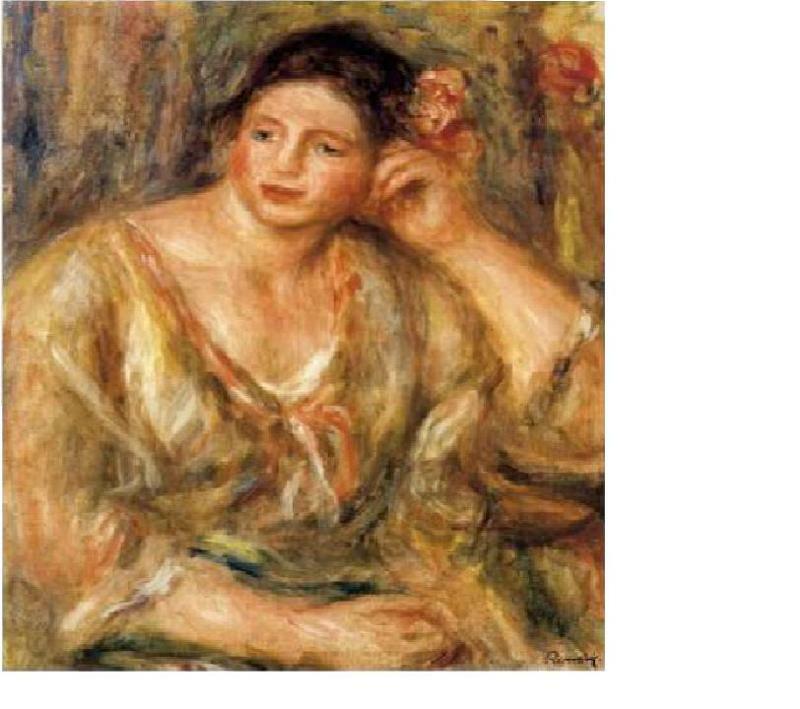 In addition to the Texan "Madeleine Leaning on Her Elbow", Interpol's Stolen Art Database identifies 18 Renoir paintings as stolen and still missing since 1938. The paintings have been stolen from places in Switzerland, France, Argentina, Germany, the United States, Japan, and Italy. In mid-June 2012, $21 million worth of artwork, including a painting by Renoir and ten drawings by Picasso, were stolen from a businessman in a violent assault in Olomouc in the Czech Republic. A Renoir stolen from Rome in 1984 re-appeared in Venice in 2009 just months after another Renoir painting stolen from Milan 33 years earlier had also been recovered. An international law enforcement operation recovered Renoir's "Young Parisian" in Los Angeles and Rembrandt's "Self Portrait" in Copenhagen in 2005. The two pictures, along with another Renoir, were stolen from the Swedish National Museum in Stockholm in 2000 when thieves used machine guns, tire spikes, and diversionary car bombs to penetrate the museum's security. Stockholm County Police had recovered Renoir's "Conversation" four years earlier in July of 2001. 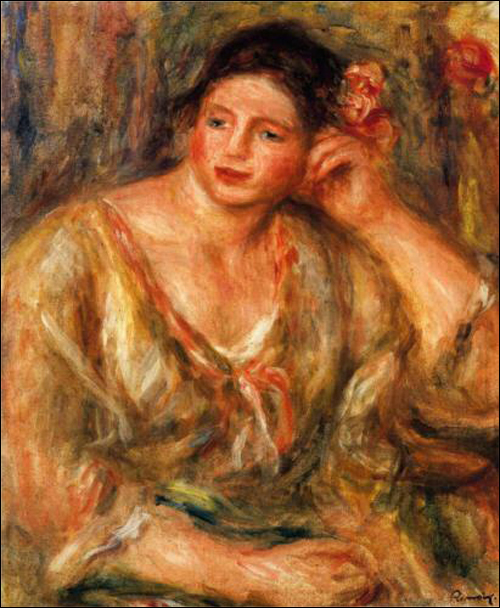 Pierre-August Renoir's Madeleine Leaning on Her Elbow with Flowers in Her Hair (1918, 50.17 x 41.28 cm) was stolen from a private collection during the evening of the 8th of September 2011 as reported to the Houston Police Department and the Federal Bureau of Investigation. Robert Wittman, Robert Whittman, Inc., PO Box 653, Chester Heights, PA 19017, USA Tel: 610-361-8929, email: info@robertwittmaninc.com. ARCA blog contacted Mr. Marinello and asked for more information. "Unfortunately, we cannot comment on the theft due to the fact that it is a pending investigation by the Houston PD and Federal Bureau of Investigation," Mr. Marinello responded in an email. 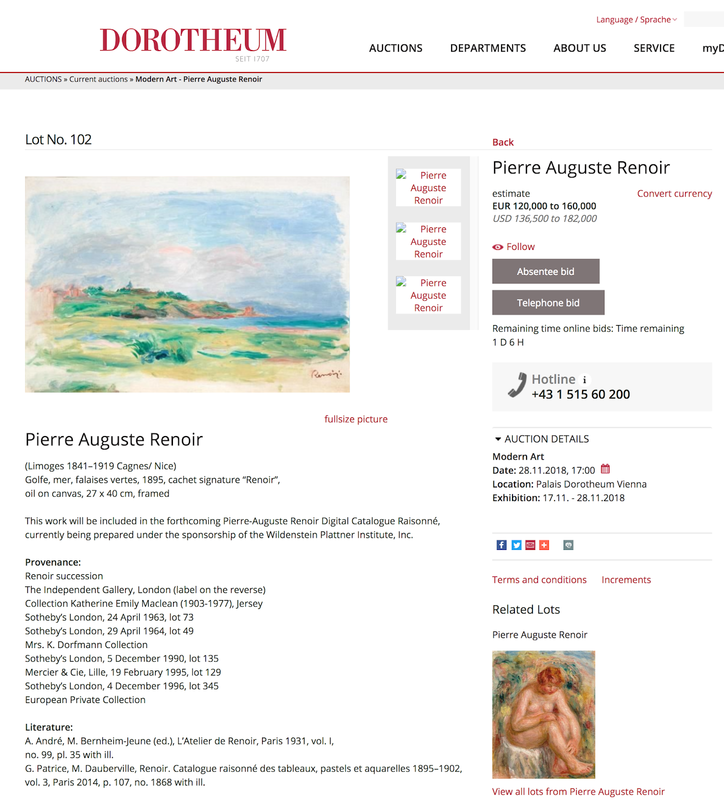 "The Art Loss Register has 259 stolen Renoirs in its database of stolen, missing, and looted artwork. We are hopeful that the publicity given to this horrific crime will produce some leads that will assist with the recovery of this painting."